Will my iPad put the smackdown on my netbook? - JP loves LIFE! 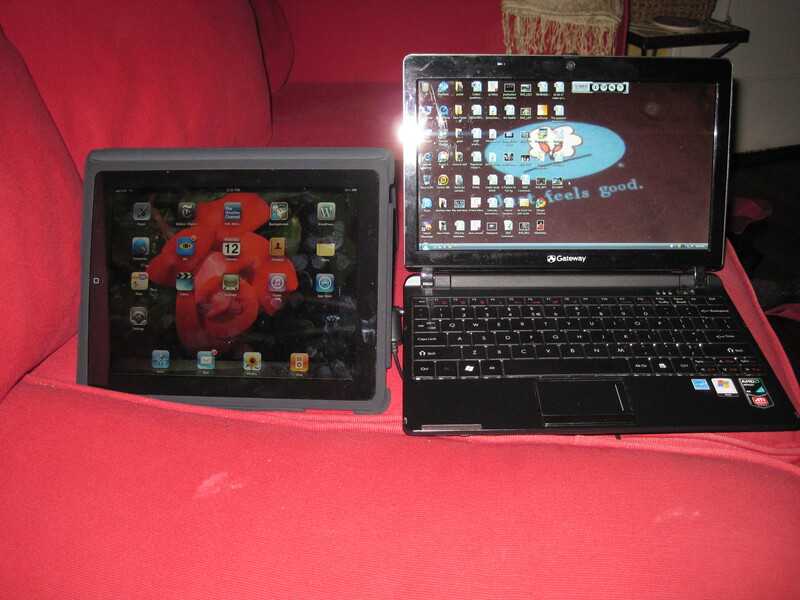 Will my iPad put the smackdown on my netbook? Last weekend, a farmer friend tweeted and buzzed the following comment “Just saw my first iPad in the wild…looks like someone ripped the keyboard (and full OS) off of a netbook. And then doubled the price.” I had to comment on the buzz and from there, a string of convo took place with the biggest focus being on Apple vs. PC value, marketing, etc . You can see it here but I wanted to take a few minutes and write my review of the iPad as well as it’s fit versus my netbook (I claimed to have domesticated both in my buzz reply). Apps I’ve installed: Microsoft Office 2007, Norton, Picasa, FlipShare, Adobe Reader, Seesmic, Skype, Google Talk, Google Chrome, a couple of other things I’m sure. Granted the iPad is new and exciting, but I think there is still an important role for my netbook — and the laptop I’m using as I type this up! Where do I anticipate using the iPad most? Short personal trips like this past weekend’s jaunt over to North Carolina for a niece’s graduation. I was able to check weather, get quick directions, stay up on what’s happening in the world and my social networks. I uploaded some photos but quite frankly held out for the bulk of things til I returned home. I also anticipate carrying the iPad along on business trips. It will be the easy way to stay in touch with friends on social media, give me some diversions along the route and could replace the GPS I have been known to carry. For instance, I carried it yesterday for the few hours I was spending in the backseat of a pickup going to and from an event that was able to be highlighted through twitter (I was so psyched to see Mashable’s post on twitterific integrating twitpic cause it took a few minutes to figure out uploading this one), etc. Ease of use in tight quarters like the truck or the coach seat I had. This has gotten tougher with full-sized laptops and netbooks alike as it seems the person in front of me ALWAYS feels a need to recline fully. The fact it EASILY fit into a normal sized purse, camera bag, etc. Granted, you know there is something a bit bigger in there than normal, but I’m amazed at how well it slides into everything. Speed of access — this thing took no time to get going or to access wireless or cellular towers whether I was in the city or driving down a state road with flooded fields on either side of me. Simple click throughs for quick program access. Do I still need a netbook? If not, why? If so, where does it fit? 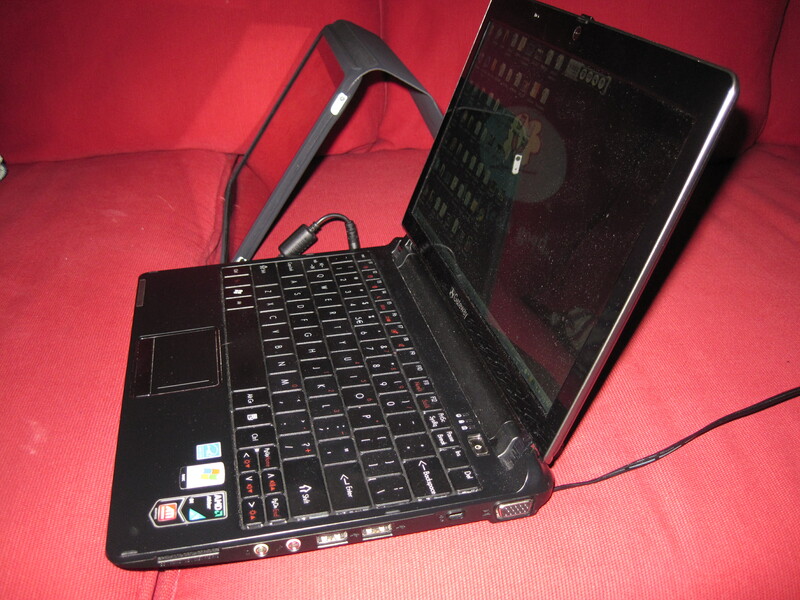 Other people will answer this differently, but I think the netbook remains a keeper for me. I love to travel and take photos. If I’m doing a trip that is heavy on photography, a higher performing machine and bigger harddrive is going to make sense. There are also some times when I’m working on a personal passion project that involves spreadsheets, presentations, etc. The netbook is a great way for me to go there. However, I think I’ll appreciate not needing that much room in the briefcase moving forward on many business trips. Lots of storage — can keep a lot of photos there to be shared or simply backed up. Full software set to edit, view, etc. What piece of technology is the loser in the smackdown? I will likely not use the netbook as much as I did in the past but I do anticipate it having a real fit. The iPad will be fun and useful at home (especially during storms when power takes out modems/routers like this post), around town (like this evening when I grabbed a bite and caught up on the news or last weekend when I showed my hairstylist pictures from her son’s facebook account while we caught up) and definitely a fun and useful add for travel. If you don’t have an iPad or netbook, you may want to consider something that makes you more mobile particularly for blogging, twitter, etc. Although smartphones are a great tool, either of these can really take you up a notch or two. If you have an iPad, tell me what apps you are using and why and you should feel free to ask me questions on mine. « Ever Get Worm Dirt for Christmas? I wasn’t actually driving (lol) but I have the 3G model which has built in mobile access like the iPhone or Blackberry. It has been AWESOME! And it still pulls wifi when that is available. For those of us in agriculture and using social media, I think this is a great fit. For instance, I’m at break from a meeting in a local hotel as I reply. Don’t need to pay for wireless. (love places with free wifi).